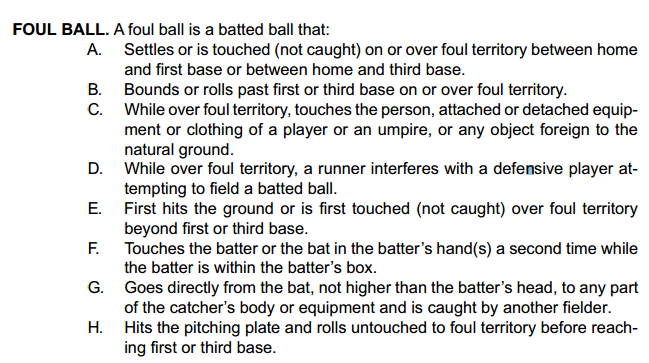 Just looking for confirmation on a fair or foul ruling on a play I made in softball the other day. Batter hits the ball down the first base line with a lot of spin. The ball bounces once in fair territory. I tried to get it before it went into foul territory with my glove but couldn't. So I am now standing in foul territory and before the ball hits the ground I kick it back into fair territory before it crosses first base. Since I was standing in foul territory I would have assumed it would have been foul the second it hit my foot but the umpire calls the ball fair. What is the correct call on this play? According to provision A, this seems to be the case.